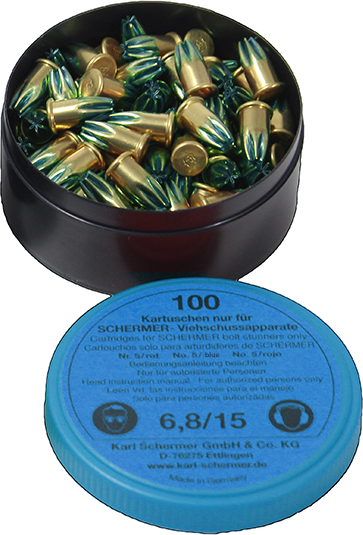 100 rounds of Power Loaded Cartridges are packed in a moisture-resistant plastic container. Heavy Blue: Stuns Cows, OX, and Steers. Stunning animals is a legal requirement before slaughter. Disclosure: These Power Loaded Cartridges cannot be shipped via air and are not returnable. If you need a different Cartridge, click on the links below.